In the first episode of Singletrack Switzerland, a new Teton Gravity Research mountain bike project produced in partnership with Swiss International Air Lines, Switzerland Tourism, and BMC Switzerland, two American mountain bikers – pro rider Brice Shirbach, and pro skier Carston Oliver – venture to Zermatt, Switzerland, where they experience alpine singletrack on a level and in a landscape ummatched in North America with the help of Epic Europe tours. With gorgeous singletrack winding down thousands of vertical feet of Swiss Alps mountainsides from gondolas, trams, and trains that climb near every peak in the valley, the pair join German BMC Pro Rider Kerstin Kögler to experience all Zermatt has to offer, including Gornergrat train-assisted descents and the giant Zmutt Glacier, which is steadily being whittled away by climate change but yet still holds an unparalleled beauty. Carston Oliver leads Brice Shirbach down epic Zermatt singletrack with the Gorner glacier, and the Italian border, in plain view. Grant Gunderson photo. 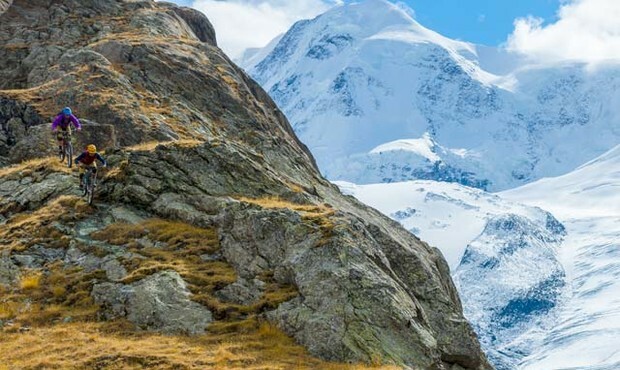 Want to win your own Singletrack Switzerland trip? Head to tetongravity.com/switzerland to enter our sweepstakes for a guided mountain bike trip in Switzerland with Swiss International Air Lines, Switzerland Tourism, and Epic Europe, along with a brand-new BMC mountain bike.